I have a lot of readers from India (Hi, India!!) And as such, I get a lot of questions from readers in India. The number one question is what they can use to make their paper quilled jewelry waterproof or water resistant. As I’ve mentioned before, it is quite difficult to make paper quilling 100% waterproof. You would have to use a good sealant to completely seal the paper and then use a thick layer of resin to coat the paper quilling. It is possible, but a tricky process. 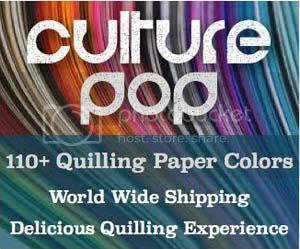 But there are many products available to make your paper quilled jewelry very water resistant. But products differ from country to country and not everything is available everywhere. In India, it can be tricky to find those products that are common elsewhere such as PPA, Diamond Glaze, Crystal Coat Glaze, etc. And where they can be found, they can be expensive. Luckily there are other options! Obviously I don’t live in India and I have not tried all of the products available there (if anyone wants to send the products my way I’ll give them a try! 😉 ). However, there ARE some quilling artists that live in India who have shared their expertise. Yay! I haven’t tried any of the products that Pritesh uses, so I can’t answer questions about their use, but you can comment on her blog posts. Iza from Quilling Wonderland also has a post. Some of the more specific questions that I get are about fevicol, quilling glaze, quilling shiner, quilling varnish, and similar products. 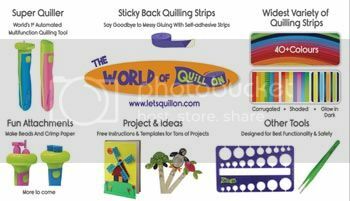 I also read a lot of comments about these products in the quilling facebook groups. Fevicol seems to be a very popular choice for quilled jewelry. It is inexpensive and easily available. If you are just making quilled jewelry for yourself and family/friends then this is probably a good choice. I know there are different types of fevicol, though, and I personally don’ t know which ones are best to use (I see a lot of people mentioning the fabric glue type for gluing the jewelry together). If you aren’t already, you can become a member of this facebook group and ask questions there as well. Many members there are from India. If you want to sell your jewelry, you want to make sure you use the best products you can. Try out some options and let your jewelry sit for at least a month to make sure that it is stable and does not change color, turn bad, etc. Of all the products available in India, the most controversial seems to be this quilling glaze, quilling shiner, quilling varnish, etc. These seem to be products sold by different people. I don’t know if they are the same product with different names or different products. Some people have suggested their use, but MOST people say that they tried them and they did NOT work. So if you want to try these products, don’t put them on your best pieces until you have tested them on several other pieces. People have reported that their pieces turned white after only a couple hours or a couple days. Others said that they looked great at first but within a week or a month they got ugly white patches on them. I haven’t used these products or seen them, but people have sent me their photos of the results and they are not pretty. I honestly don’t know whether it is user error or product error, but I wanted to put out this warning. Make sure you test on practice pieces first! Some people have ruined their beautiful hard work after using these products. Photo by Gayathri A. 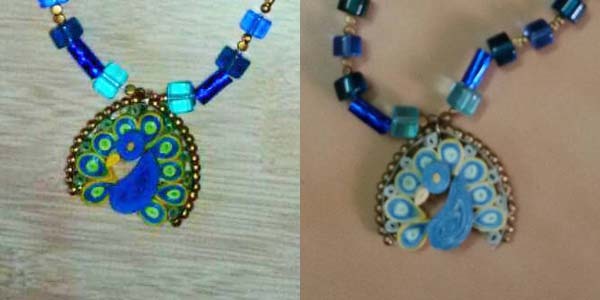 – before and after applying Quilling Varnish. It took a couple days before it got a whitish film over it, ruining the look and finish. Someone recently sent me some photos of their jhumka earrings that had been ruined with white spots. They had used fevicol to seal the piece and then they used clear nail varnish as a shiny topcoat. After a month it got ugly white patches. My guess is that either the fevicol wasn’t completely dry when the nail varnish went on, or there was some sort of chemical reaction between the fevicol and the varnish. When using multiple products you again should test on some practice pieces first, let it sit for a few days to a month to check any results. I have never had any bad reactions with the sealants, topcoats, or glazes that I have used, but I have only used products meant for crafts – paper crafts in particular. When you start using products that are meant for fingernails, wood finish, etc. then you can’t never guarantee how they will react with each other. If your budget allows and you would like to try some imported products, you might be able to find Mod Podge at some craft shops. Here is a list of shops in India that sell Mod Podge (this is from another website, I have no idea how updated this list is). To learn how to use Mod Podge on your quilled jewelry, check out these posts: Part 1, Part 2, Part 3, Part 4, and Part 5. At CraftGully.com you can find PPA matte, PPA gloss, and Crystal Coat Glaze. These are some of the best products I have used. I use PPA for all of my quilling glue, and I also use it sometimes as a sealant/topcoat. The PPA matte is very matte so if you want your quilled jewelry to not be shiny at all, to look just like paper, then that should be your topcoat! At thecraftshop.in you can find Crystal Coat Glaze, Mod Podge Matte, Mod Podge gloss, Mod Podge Dimensional Magic, and Mod Podge Sampler. You can also find Aleene’s tacky glue here. Not good for a sealant or topcoat, but it is good if you want a strong glue for gluing your jewelry together. A couple more products they have here are Inkssentials Glue n Seal Matte Finish, and Inkssentials Glue n Seal Gloss Finish. I haven’t used these, but as it says it is a sealer it might be worth a try! If you have tried these, let me know how they work with quilled jewelry so I can update this post! Oh, and if you are looking for a strong glue to glue your quilled jewelry onto jewelry earring studs and similar items, e6000 glue works great for that. At kamya.com you can find Crystal Coat Glaze with the quilling tools. At craftadda.com they have some decoupage glues and varnishes that might very well work (decoupage is for paper, so the decoupage varnish in particular might be a good fit for quilled jewelry. I haven’t tried that brand myself, though). anandastationery.blogspot.in also has a wide variety of Mod Podge. on Amazon.in you can find Mod Podge, Diamond Glaze, and more, but the prices look kind of crazy. Maybe because they include overseas shipping or something, I don’t know. Are you from India? Do you have some expertise to lend to this article? If so, let me know in the comments or send me a message and I may add your info to this page (with credit to you!). Looking for more articles about sealing your quilled jewelry? Click here for all posts that I have so far. *None of the links in this post are affiliate links, they are just links for your convenience so you can find the products you are looking for. Read all my posts about mod podge, it’ll give all the info and tips. The links are here in this article. Basically, mod Podge, when used correctly, will give a good water resistant finish. It is not as strong as an acrylic varnish, for example, but it is reliable and will not change the color of your paper. thank you Honey for the mention! 🙂 BTW Great post! These are interesting tips for selling jewelry. It helps me to start a business.All jewelry are cool .thanks for sharing . I have wood varnish, not water based I think. Can that be used as sealant? You can give it a try. Make sure to use it in a ventilated area as wood varnish has toxic fumes. Also check if it is clear or if it is colored. Most wood varnish has a hint of color to it.